Monitoring systems receive and accumulate large amounts of data as they run. The longer a monitoring system runs, the more data it collects. Most monitoring systems do not have the tools for long-term data analysis and storage. They'll either keep every reading, which causes storage issues, or remove old data upon reaching a certain threshold, which prevents us from analyzing our system performance over a long period of time. Some monitoring systems, such as Zabbix, give the ability to store both exact and averaged data values, but their customization capabilities are very limited. Time series databases help us solve the problem of storing large amounts of historical data. A time series is just a sequence of data points over time, and a time series database is optimized to store this type of data. In our final configuration, our monitoring agent sends data points to Carbon, which has the carbon-relay, carbon-aggregator, and carbon-cache components. Carbon writes the data to a Whisper database. Graphite-Web displays the data on a web page, which can be viewed by users. More information about the EPEL repository is available on fedoraproject.org. [REQUIRED] Unable to import the 'whisper' or 'ceres' modules, please download this package from the Graphite project page and install it. 6 optional dependencies not met. Please consider the optional items before proceeding. 5 necessary dependencies not met. Graphite will not function until these dependencies are fulfilled. [OPTIONAL] Unable to import the 'ldap' module, do you have python-ldap installed for python 2.7.5? Without python-ldap, you will not be able to use LDAP authentication in the graphite webapp. 2 optional dependencies not met. Please consider the optional items before proceeding. We won't need LDAP authentication or the RRD database in this tutorial. Now all components are installed and you are ready to configure Graphite. Graphite includes several sample configuration files. All you need is to copy and edit them as shown in the next step. The main config file is carbon.conf. It defines the settings for each Carbon daemon. Each setting within this file is documented via informative comments in the file itself. You can examine them, but for our tutorial, the default settings are suitable. Next, you will need to edit the storage-schemas.conf file which describes retention rates for storing metrics. It matches metric paths to patterns, and tells Whisper what frequency and history of datapoints to store. The size of the disk space occupied by data depends on the settings in this file. Whisper will downsample metrics as thresholds for retention are exceeded. Note: The sections are applied in order from the top to bottom and the first pattern that matches the metric name is used! Next, you may need the storage-aggregation.conf file which defines how to aggregate data to lower-precision retentions. This file is optional. If it is not present, defaults will be used. By default, as the data hits the next retention interval, Graphite will sum all metrics ending with .count, get the minimum/maximum of all metrics ending with .min/.max respectively, and average everything else. carbon-relay is used for replication and sharding. carbon-relay can run together with (or instead of) carbon-cache and relay incoming metrics to multiple backend carbon-caches running on different ports or hosts. The regular expression pattern in first section will match any metric that starts with Zabbix_server and all data will be transmitted to the host with IP address 10.0.0.4. All other data will be transmitted to localhost and two other hosts. carbon-aggregator is used to buffer metrics over time before reporting them to the Whisper database. It can be run in front of carbon-cache. Aggregation rules allow you to add several metrics together, reducing the need to summarize many metrics in every URL. This will capture any received metrics that match input_pattern for calculating an aggregate metric. The calculation will occur every frequency seconds. Available aggregation methods are: sum or avg. The name of the aggregate metric will be derived from output_template filling in any captured fields from input_pattern. For example, let's imagine that your organization has 25 branch offices, and you want to build the graph of their total internet traffic. You can store the data from each branch office, build the graph for each of them and then sum them. However, this type of operation is expensive: in order to render the summary graph you first need to read the 25 different metrics, then you need to combine the results by applying the summation function, and finally build the graph. Given this configuration, metrics will be buffered for 60 seconds, combined using the sum function, and stored to the new metric file. The configuration of Carbon is finished: Carbon is running and ready to receive the data. You can now configure the web interface. Graphite-Web is the Django web application that runs under Apache/mod_wsgi. Locate the SECRET_KEY and enter a unique value. This is used to provide cryptographic signing; you can put anything here as long as it's unique. Locate the TIME_ZONE update it to the time zone for the installation. See the list of time zones if needed. 407 static files copied to '/opt/graphite/static'. Make sure your ServerName is set to your domain or IP address. The Alias line should be set correctly already. Add the <Directory> block below it. By default, anyone who knows the address of the server running the web application can view any data. To prevent this you can set password access. The installation is complete! Launch your browser and go to the address http://your_server_ip/. Enter the username and password that you set in Step 5. Graphite can use data from many different monitoring services. In this example, we will use collectd. It's a daemon which periodically collects system performance statistics and provides mechanisms to store or send the values in a variety of ways. More information about collectd is available at the official site. Set the Hostname in the Global settings. This can be any name you want and will be used in the web interface to designate this host. Note: To troubleshoot, check the status of ollectd status with the command sudo systemctl status collectd.service. This will show you if it's having any trouble writing to Graphite. Collectd immediately begins to send data to the Graphite. Refresh the web page. If you expand the Metrics folder, you should see collectd listed. After some time, you will be able to see the pretty graphs of your data as shown below. Graphite has sophisticated data display options. For example, to obtain an image similar to one shown in the image above, you need to perform several actions. 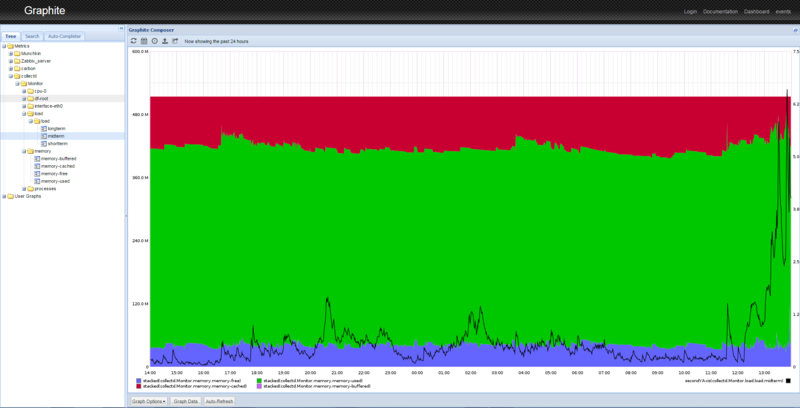 From the left panel, click Metrics > collectd > Monitor (or the Hostname you configured in Step 7) > load > load > midterm. You will see the graph of the load average. Click the Graph Data button below the graph. Click the Add button on the right of the popup. Paste the following line: collectd.Monitor.memory.*. This will select all of the memory-related graphs. If you used a different name for your host, use that name instead of Monitor. Press OK. You will see several graphs on a single screen. Because of differences in scale, the load curve turned into a line. To fix this, you must perform the following manipulations with the graphs. Click the Graph Data button again. Click the Apply Function button. Enter black and press OK. Select Special > Draw Stacked. You will see the image similar to one shown at the end of Step 7. This is just one way to display the data from your server. You can mix and combine different data on the same graph, apply different functions, scale data, calculate moving averages, forecast data, and so on. 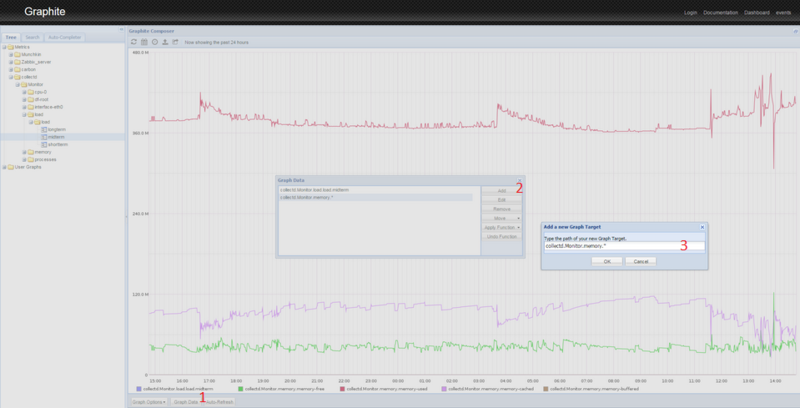 Graphite is a powerful tool for storing and analyzing time series data. After completing this tutorial you should have a general understanding of how to install it, do basic setup, get your data into it, and manipulate the accumulated data. Graphite can be used as dashboard. You can monitor key indicators: CPU utilization, memory usage, utilization of network interfaces, and so on. Graphite has many functions for data analysis. You can use those functions to transform, combine, and perform computations on series data. Most functions can be applied sequentially. For example, you can summarize incoming traffic from all branch offices, and than compare it to the sum of outgoing traffic. Or you can summarize all incoming and outgoing traffic from all branch offices, build a summary graph over a long period of time, and see the trend for future capacity planning.